Locals share their passion for nautical pursuits. DREAM PLACE TO BRING YOUR BOAT: Anyplace in the Mediterranean. FIRST MEMORY OF BEING ON A BOAT: Before we immigrated to the United States, my first boating memories are with my family, sailing the fjords in Norway. FAVORITE NAUTICAL STORY: Once, sailing around Block Island, we got stuck in fog. We couldn’t see a foot in front of us, and I had to trust the boat’s instruments and make our way back to Mattituck. There were moments when we realized another vessel was passing perilously close—all we could see was the outline of a railing moving by swiftly. Pretty hair-raising. LIFE LESSON LEARNED FROM BOATING: The single most important lesson: self-confidence. 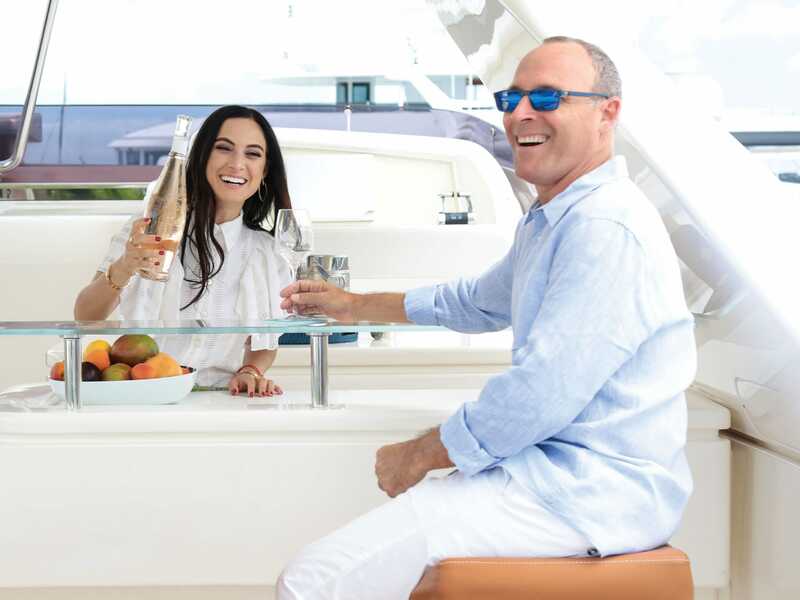 CONCERNS FACING THE YACHTING COMMUNITY: The biggest concern as a boater, and for boaters worldwide, is clean water. The oceans are not dumping grounds, and they deserve our respect, 100 percent. IF YOU COULD INVITE ONE PERSON ON YOUR BOAT: Easy and always: my dad. 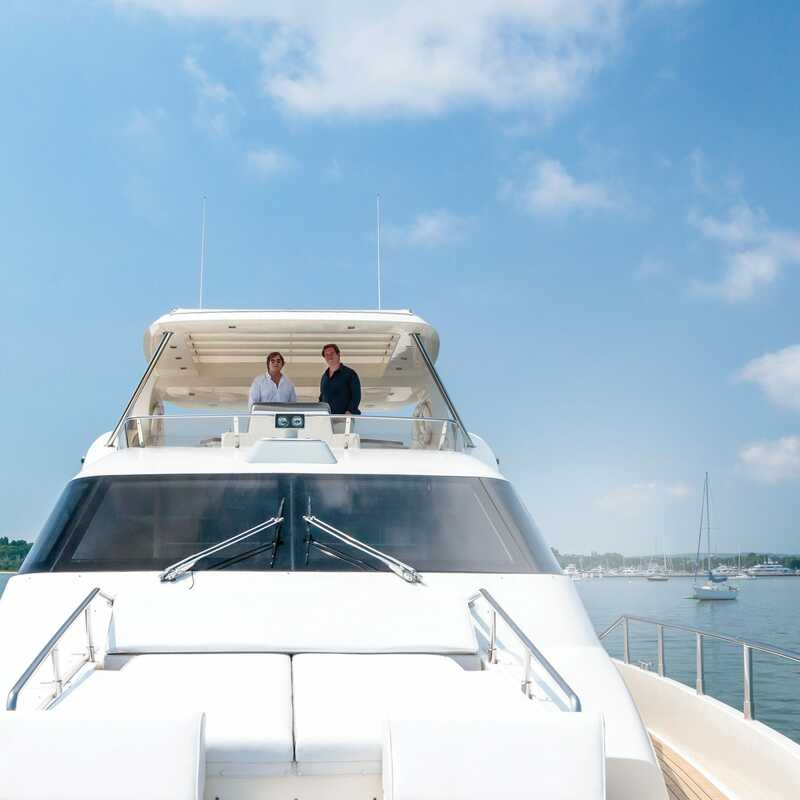 HOW OWNING A BOAT HAS CHANGED YOUR LIFE IN THE HAMPTONS: My boat is my solace. It provides me with muchneeded downtime and peace. MIKI: I would love to spend a summer on the Mediterranean. I’ve always wanted to explore places like the French Riviera, the Amalfi Coast, Greece and Croatia with my vessel. 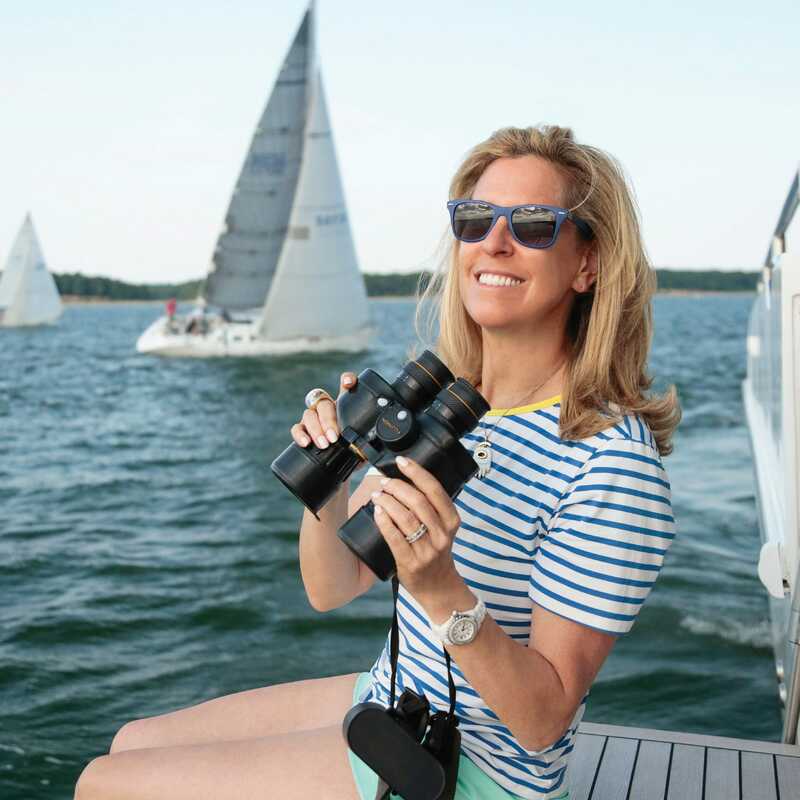 DANIELLE: Sag Harbor has a unique identity, that small-village feel with a nautical element. Waking to the sound of the water then drinking your morning coffee and reading the local newspaper is one of the many pleasures of living on the water. DANIELLE: Besides Henry, my French bulldog puppy… a backgammon set (it’s impossible to beat me), a great book and of course Whispering Angel! MIKI: The Exumas in the Bahamas. It’s one of our favorite family vacation spots. Best known for having some of the most impeccable beaches, there are also the swimming pigs! DANIELLE: I was in fifth grade when my dad [Miki] let me take the wheel for the first time. (Only in the open ocean, of course.) We were sailing in the British Virgin Islands on a four-hour trip, when he taught me how to navigate, steer the wheel and about all the different components of the mechanical systems. MIKI: We invite friends and family all the time, but unfortunately my father is not with us anymore. If I had a time machine, I would invite him to share the passion I have for boating and all the remarkable memories we created as a family. DANIELLE: We live in an era when disconnecting from technology and sitting without distractions with your friends or family seems nearly impossible. Thankfully, the Hamptons does not thrive on cell service. But seriously, this is the most peaceful way to spend quality time with the people I love most. DREAM PLACE TO BRING YOUR BOAT: I would love to be able to take her (and my wife, my son and my stepdaughter) to Maremma, Italy. I once lived in Italy and have traveled there more times than I can remember, but I would love to explore some of the coastline by boat. FAVORITE PLACE TO BOAT LOCALLY: Case’s Place, a little hideaway on the North Fork. The owner, Maryann, is the best host, and the views are off the charts. YOUR MUST-HAVES WHEN OUT ON THE WATER: EPIRB personal locator beacon, Oxx Coffeeboxx (there’s nothing like a hot coffee at 3am, 100 miles offshore), Mountain House freeze-dried breakfast, standup fishing rods and some great company. MOST EXOTIC PLACE YOU HAVE BROUGHT YOUR BOAT: East Chop, Chief Brody’s house from the movie Jaws. My wife’s family lives there half the year. It doesn’t look the same as in the film, but tying the Ginger Ninja up at the dock was out of this world. FIRST MEMORY OF BEING ON A BOAT: When I was 7, we were in Corfu for a family holiday and went out for a day trip on a traditional Greek wooden motor sailor. The waves lapping on the hull, the smell of the varnished deck and the freedom for adventure stuck with me. FAVORITE NAUTICAL STORY: I proposed to my wife at the 1-mile buoy outside of Shinnecock Inlet. I tied the ring to a spinning rod, cast it into the ocean and had her reel it in. LIFE LESSON LEARNED FROM BOATING: You can never be too prepared. When things go wrong, they do so very quickly. The great thing about the fishing community is that while we are very competitive, we all look out for one another, especially when we’re 100-plus miles offshore. IF YOU COULD INVITE ONE PERSON ON YOUR BOAT: In a fantasy world, Captain Quint, the character Robert Shaw plays in Jaws. In reality, though, Jimmy Buffett. DREAM PLACE TO BRING YOUR BOAT: The Galapagos Islands. Although not possible, I’d love to go to Raja in Indonesia. YOUR MUST-HAVES WHEN OUT ON THE WATER: Juice Press, a 1,000-piece puzzle, a great book, a bottle of rosé, binoculars and Gilligan’s Island episodes to binge-watch with our children in case of rain. MOST EXOTIC PLACE YOU HAVE BROUGHT YOUR BOAT: We travel the Exumas, Bahamas, every winter. FIRST MEMORY OF BEING ON A BOAT: When I was 10 years old, I would cruise around Three Mile Harbor with Tony Duke and his family. My mother was on the board of Boys Harbor, and she, my sisters and I would spend long weekends at Tony and Luly Duke’s home and volunteer at the camp. FAVORITE NAUTICAL STORY: Two years ago, while spending time in Maine, we came upon two humpback whales just floating in the water. We turned off our engines as we approached and just floated with them for 10 minutes. They dove under our boat and came up on the other side. It seemed as though they were playing with us. As they swam away, one of the whales lifted his fin as if to wave goodbye, while the other flipped his tail way up in the air. It was an unforgettable experience. LIFE LESSON LEARNED FROM BOATING: To honor Mother Nature and all of her inhabitants. I have been alternating between vegetarian and pescatarian for more than 30 years. I pledged a few months ago to give up eating fish once and for all after an incredible encounter with nurse sharks in Compass Cay. IF YOU COULD INVITE ONE PERSON ON YOUR BOAT: It would be a toss-up between Winston Churchill and my grandmother.